Closing A&E departments has led to a deterioration in the performance of those that remain in North West London. A new analysis warns of the risk to patients if further A&Es are closed. Press release, 19th April 2017. EMBARGOED UNTIL 00.01 Monday 24th April 2017. Performance against the 95% 4-hour wait target dropped to as low as 60%, meaning that up to 40% of patients requiring serious treatment had to wait over 4 hours to be assessed and admitted to an appropriate bed. Since then the performance of North West London hospitals has been some of the worst in the country, sometimes managing to treat fewer than half of the patients within four hours. For time-sensitive conditions such as sepsis or respiratory failure such delays are life-threatening. 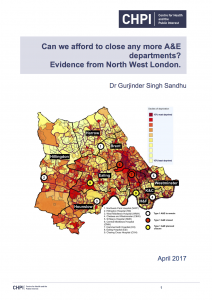 The paper also points out that the closures aggravate health inequalities, hitting the most deprived boroughs in the region. The Centre for Health and the Public Interest is an independent think tank promoting evidence-based policy in line with the founding principles of the NHS. We publish reports and analyses on key issues affecting the NHS, social care and public health. These reports are produced by respected academics and health and social care practitioners. The Centre seeks to frame the policy debate in a way that is evidence-based and open and accessible to citizens. Dr Gurjinder Singh Sandhu is a Consultant Physician specializing in Infectious Diseases and Acute Medicine. He has a specialist interest in Tuberculosis, Poverty and Health Inequalities. He was awarded a Wellcome Trust Tropical Fellowship and completed his PhD in 2010, studying Tuberculosis in resource poor countries. Dr Sandhu currently works in Acute Medicine and is developing an interest in health inequalities in elderly care medicine. Dr Sandhu is an active member of Ealing Save Our NHS.